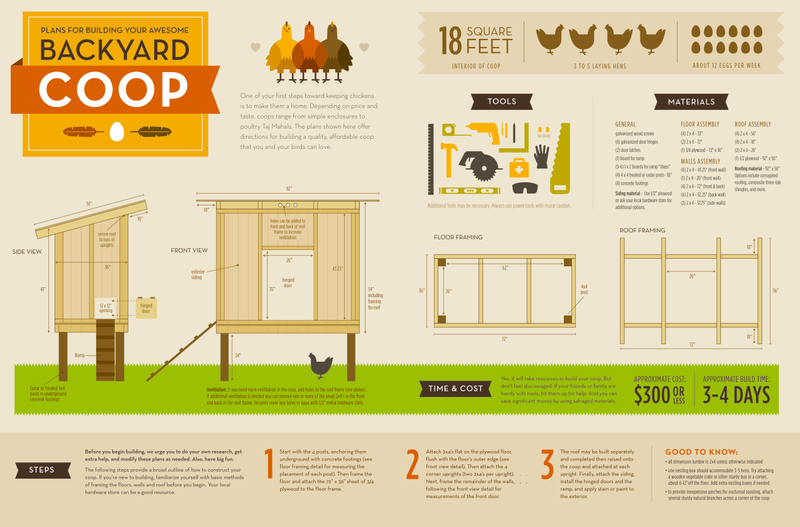 I am flattered that the author of a new chicken book called Henhouse has turned my humble coop-building instructions into this amazing infographic and posted it on Visual.ly. This is a slightly simplified version of our coop, with no “chicken Guantanamo” cage underneath, or aviary around it. But after many years of use, this design has served us well and we still heartily endorse it for urban backyards. Wonderful coop-building infographic by Timothy Sanders. Click to enlarge. My coop-plans blog post remains very popular— if you have built this coop, or a version of it, I would love to see photos! I have built a version of your chicken coop! I love it – so do the chickens! Where should I send a picture to? What’s your email? Hey guys! I’m building a very similar plan for our 2 ducklings and adult duck. We are in Dallas, TX. Do you think our ducks will be happy with the same SF (18 SF)? I built a separate “run” for their daytime play. Also, I’m putting a little herb garden on the roof for better insulation and hopefully a snack they’ll enjoy. I like the graphic very much. Saw it before, but didn’t know the creator. It was cheaper, but your is better looking. Hi to every single one, it’s really a good for me to go to see this site, it contains priceless Information. Absolutely love this infographic guys! You are today where your thoughts have brought you http://weddinginvitations4u.net/invite:161465152381860135 you will be tomorrow where your thoughts take you. I was wondering if I could get a pdf version of the infographic build plans for this coop. The jpg version is a bit blurry when blown up. I would love to build this! Do you still have a version of the plans that includes the “Chicken Guantanamo” and aviary? I’d love to build this coop including those components. Great graphic but it is very pixilated when you download it. You cannot read it to actually build the coop. Do you have a higher quality graphic you can share with us? Thank you so much for the coop plans. I am typing them into a word document so that I can read the small writing better and plan on building a coop this week. I am struggling to figure out the length of the 2×4 in the material list that is listed under Walls Assembly that says (2) 2×4 – ???? (side walls). Any chance that you may know what it is off hand? I’d love to see the infographic in better resolution, do you have a PDF or a higher res JPG of it? The current one is really blurry and I can’t read the numbers.